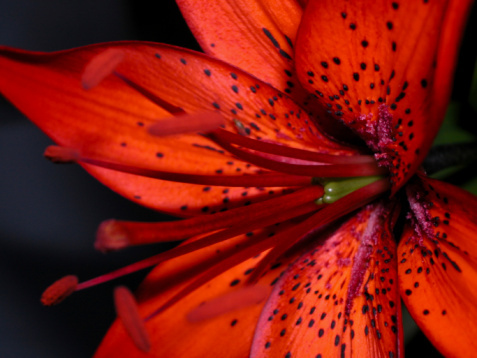 Lilies are large, bright plants that live for many years. The roots and bulbs stay alive underground in winter, even though the upper foliage dies after the first freeze. Tiger lilies bear exotic orange and black or brown blooms and grow down to U.S. Department of Agriculture growing zone 3. These are hardy lilies, but still require the right planting and care to produce their summer blooms. Tiger lilies grow in orange, red and even yellow varieties. Tiger lilies grow from spring to fall, with mid- to late-summer blooms. Bulbs take 120 to 130 days to grow and bear their flowers, so first-year blooming depends on timely and correct planting. Established bulbs and plants will bloom on a consistent schedule. Plant tiger lily bulbs from spring through summer, but keep in mind that later plantings will delay blooming until each bulb's second year. The best time to plant tiger lilies is in early spring, just after the last frost in your region. Tiger lilies will grow and bloom successfully in full or partial sun, depending on your growing region. In warm zones 7 to 10, plant the lilies in full to partial sun and depend on the warm weather to support the plants. In colder regions, plant the bulbs in full sunshine. 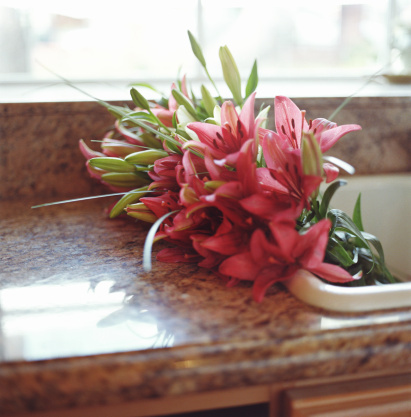 Use organic compost at planting to give the lilies the nutrition and drainage they require for blooming. Water tiger lily bulbs with 2 to 3 inches of water every week to keep them healthy and productive through the growing season. Remove spent blooms from the plant to keep the plants from going to seed and to encourage them to rebloom again and again.